Unfortunately as the saying goes - there is no snooze alarm on a cat that wants breakfast. Cass (unusually) led the charge this morning and Tink had to be woken up for his food. Once the inner cats are full they spend the next few hours playing getting everywhere they shouldn't be. They have a huge amount of toys and enjoy playing with things which aren't toys as well (curtains, house plants, dripping taps). 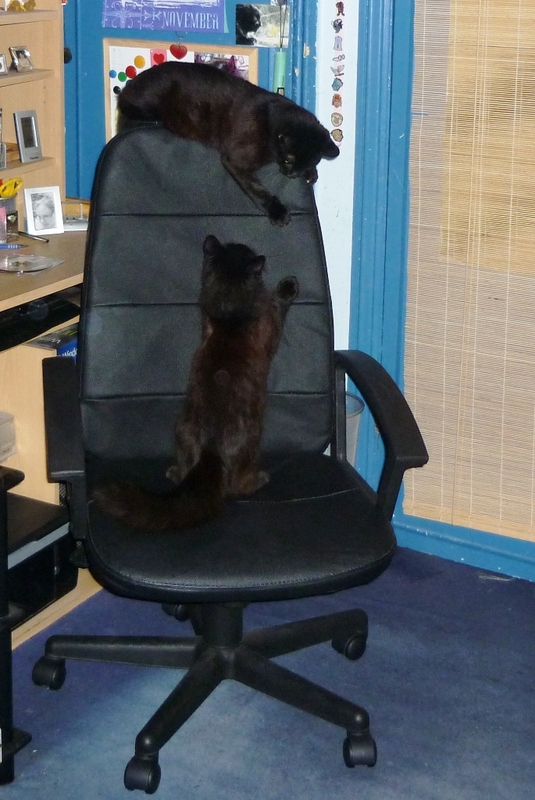 The desk chair in the living room is one of their favourite places to sit, and since Tink has learnt to climb the chair it is now another part of their playground. Cass appears to have exhausted himself and wandered off to sleep somewhere (well he was up first). Tink is still getting into whatever he can manage to get into. Where possible this includes watching the goldfish.